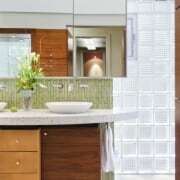 Walnut cabinetry lines the entry to this glass block-walled bathroom. 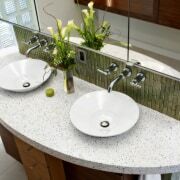 The walnut, which is laid with the grain running horizontally, reappears on the vanity unit in the center of the room. 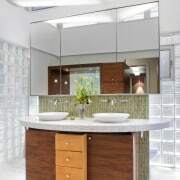 In planning a remodel for this house, the designer literally had to step outside and place the master bathroom in its own glass-walled room. Designer Mark Lind, who worked with CG&S Design-Build on the project, says the bathroom is outside the footprint of the solid concrete house that was built in the '50s. "It seemed to me the best solution was to contrast all those massive concrete walls with transparent, ephemeral ones," Lind says. "Because we also needed to provide privacy, we chose a glass block that is an exact match for the original blocks that enclose the front entry." 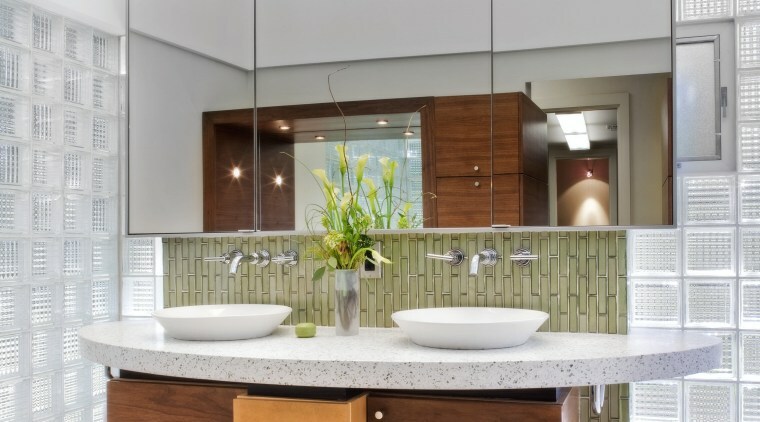 To avoid interrupting the visual impact of the glass block walls, the designer positioned the vanity right in the center of the bathroom. 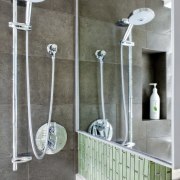 This also ensures it screens the shower and toilet areas. 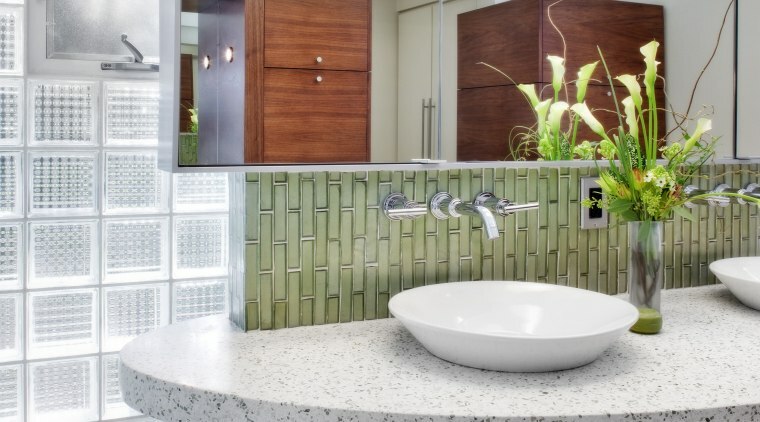 "The whole area needed to be carefully planned as we didn't want water from the shower spraying outside the designated area, and we didn't want a door closing off the shower," says Lind. "It would have ruined the simple beauty of the design." 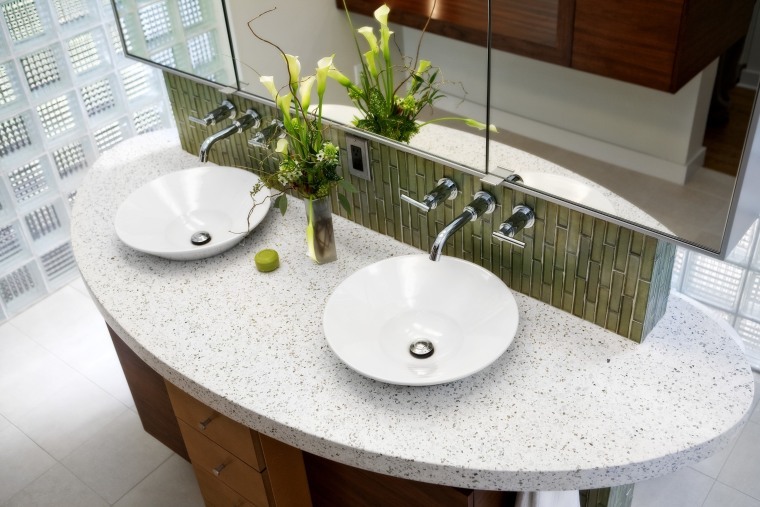 Walker Zanger green glass tiles on the backsplash are another pivotal design element the tiles run vertically and are reminiscent of bamboo. 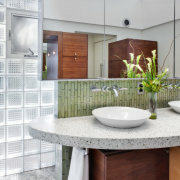 Other materials accentuating the glass tiles include walnut cabinetry and a cast concrete vanity top. The top mimics, in reverse, the boomerang shape of a suspended Artemide fluorescent light fixture.